Instant price estimates for property. Is it impossible or possible? There are some online appraisal websites where if you click on the tab and enter an address it will ask a few questions and give you a value estimate. You are required re-read the cautions about the service as it does have some limitations. That being said, I have played with the tool, and it is not too scary as thought but if it is accurate? !!! Some REALTORS do over the phone evaluations. And they claim to be exactly and precisely right. Although I will do them in certain areas that I am highly familiar with I always recommend allowing a proper market evaluation as some things you may not mention to the REALTOR may alter the value either up or down, and ultimately not seeing the property does not allow us to give you the best Market Value Evaluation. If you would like an instant price estimate look in your mail for a local & Licensed REALTOR who advertises over the phone market evaluations and call them. I however caution you that you would do yourself far better service to contact a reputable Licensed REALTOR and invite them to your home. Good Luck and have a great day. I’ve been in the business for a time and never do estimates from my desk or home office. Sorry, I’m not Magician and a house can be from zero to a hero, I mean unpredictable on unseen. In essence, I do not offer “no service kind of service”. There is none in the world who can guess what your house is like, how much you have spent in upgrades over the home ownership period in comparison to your neighbour who still has green shag carpets from 1969 and war torn hardwood from dog nails etc. When you pay nothing, you generally get nothing. I will not sign an estimate if I do not have all the facts considered and reviewed personally. If you do want a quick and very rough estimate of the value of your home, I would look to your assessed value for property tax purposes, the report you get every year from MPAC report. It will likely give you an idea if your property is worth $300,000 or $3 million. But if you want more insight then call a reputable realtor for a proper comparative market analysis (CMA). This analysis CMA will give you a better idea what your property would actually sell for in the current market conditions. Many factors come into play for CMA – what is the overall real estate market like, what is the market like for your specific property, what condition is your property in and how does your property compare to similar homes currently listed right now, so it is called comparables. For example, if your neighbor with a fairly similar property accepts a low ball offer because he already bought the new home and he is anxious to sell this old one that is unfortunately going to affect the market value of your property. Most importantly this estimate is likely to be a range rather than a single number, like the estimate of price could be “from $410k to $430k”. Some properties are difficult to put an accurate price on and the sales price obtained could be within a large range. Other properties are in an area with many similar properties that have sold recently and are a little easier to put a price on within a fairly tight range agreeable to seller. I spend a considerable amount of time on each comparative market evaluation that I do and I think my clients would agree that I provide useful information that would be difficult to obtain automatically or instantly. I think in this situation the phrase “If it is worth doing, it is worth doing right” is so true. I always research properties on-line and off-line before I actually visit the property to do a market evaluation. It is getting easier to find information online but there really is no substitute for seeing a property, its setting and comparable properties in person. 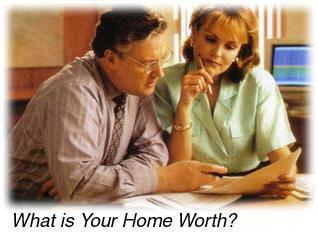 Hopefully the ‘instant’ Market Evaluation that you seek will not be used to determine the price to list your home. You can probably get one or two evaluations at no expense to you anyway from your local real estate brokerages. It may not be instant, but it will be customized for your unique home and not just made up ones & instead of based on last year’s statistics for all homes in the city. I am sure you will agree with the personal talk we had thru this article, if you like to have your property evaluated you can contact me directly on cell and arrange appointment or contact me online to set an appointment of your property. For most Canadians, shopping around for a mortgage is something that happens once every five years. This is the time to figure out if you can get a better mortgage rate, and lock in something new for another five years. But if you want to get the best possible mortgage rate, whether you are renewing, refinancing or buying a home, you will have to do a little legwork. First Things First: What’s Your Financial Situation? You should also have a general idea of what you can afford in a home, as well as how much you are planning to borrow. This will give you basic information that banks and mortgage brokers can use as they prepare a quote for you. Before you start looking for a good mortgage rate, you need to make sure you are in a position to afford your mortgage. With a renewal or refinance, it is a little bit easier to know what you can afford — you are already making payments! If you are buying a home, though, you will need to consider the costs of home ownership, and recognize that a home comes with costs beyond the mortgage. Make sure that you can afford the mortgage plus the added expenses that you will see. There are many online calculators that can give you an idea of what kind of mortgage you can afford. Once you know your financial situation, and once you have a pretty good idea of what you can afford, it is time to start shopping around. Be sure to familiarize yourself with the different mortgage options available, and get a general idea of the mortgage product that is most likely to benefit your individual situation. Then, once you have an idea of what you are looking for, it’s time to shop around. You might want to start at your bank, and then compare what your bank is offering to what is being offered by other banks, and by what a mortgage broker is likely to get you. Make sure you get all offers in writing. Let banks and brokers know the basics of your situation, without filling out a full mortgage application. Instead, treat each lender or broker you speak with as if you are interviewing him or her. Find out how knowledgeable each is about mortgage products and services, and find out what sort of rate is available to you. You can try to ask for the best rate in some cases, although you may have to use the posted rate as a starting point for negotiating down. Be sure you are comparing apples to apples throughout the process, and make sure that banks and brokers know that you are shopping around. You want them to offer their best possible mortgage rate, and you want to be able to make meaningful comparisons between that rate and what is being offered elsewhere. In the end, what is offered to you will depend on your financial and credit situation, as well as market rates. But, by shopping around you can figure out what would work best for you. Former Marijuana Grow Houses For Sale? When you go house hunting you should be looking for more than “For Sale” signs. Other signs you should be alert to be indications the house you are considering may have been a former grow op. this info is especially for House hunters who do not include Real Estate Pro. In their initial search. With so much at stake, take advantage of the experience and knowledge of a registered real estate broker or salesperson. Brokers and salespersons are obligated to disclose any material fact about a property or its history they are aware of that could affect a person’s decision to buy. A broker or salesperson may also be able to provide you with a Seller Property Information Statement (SPIS) if one exists. Grow ops can be hard to spot after an operation has been dismantled, particularly if the house’s grow-op history is several buyers in the past. Mould especially can be difficult to detect. They may look like any other home on the surface, but grow ops undergo a number of renovations. Although they usually require extensive repair, former grow houses are just as likely to be given only cosmetic alterations to hide the real damage before being put up for sale. You should give serious consideration to having a home inspected to reduce the possibility of buying a home that has been cosmetically renovated. In some circumstances, you may also want to consider having a professional engineer check for possible structural damage. 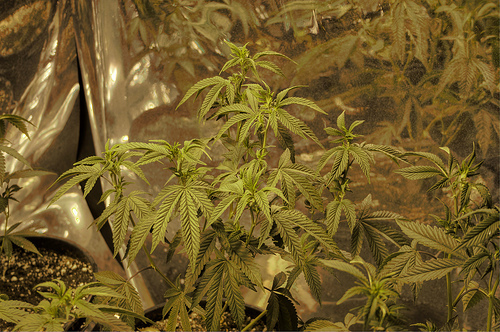 If you suspect that a property is being used as a grow-op, you should contact your local police department or call Crime Stoppers. Please note that the “top ten” signs listed above are only some of the signs that a property has been used as a grow op. This publication contains general information only and should not be construed as legal or professional advice. For legal or professional advice specific to your real estate transaction or situation, you should seek the services of a competent professional. You may also click on the check mark under School Info to get the full contact info and all details for the school from the corresponding school board website. Where it was available we also provided a link to the direct website of the schools. In case the school district found in your boundaries does not fall into our top schools list and you would like to know the Fraser Institute Rankings for that school simply click HERE for elementary schools, and HERE for secondary schools. For further information or if you would like to set up a consultation with me personally to further discuss your home buying options in the area of the Top Toronto Schools, you can email us directly. Vijay Gandhi is Re/max Real Estate Sales Representative & Independent mortgage Agent -planner- industry insider & CENTUM Agent. If you are purchasing, refinancing or renewing your mortgage, contact Vijay or apply for a Mortgage Check-up to obtain the best available rates and terms. Please, forward my name, phone number & e-mail address to your friends, relatives, clients. This bulletin cancels and replaces IT-197R dated August 20, 1979 and IT-218 dated May 26, 1975 and applies with respect to taxation years commencing after the date of its issue. Please note that the comments in IT-102R concerning real property and its conversion from capital property to inventory and vice versa continue to apply to taxation years commencing on or before the date of issue of this bulletin. 1. A gain arising on the sale of real estate will be considered to be business income, property income or a capital gain. This bulletin does not deal with gains arising on the sale of real estate that is or was designated as a principal residence because such gains are dealt with in IT-120R3. 2. The word “business” is defined in subsection 248(1) so as to include, inter alia, an adventure or concern in the nature of trade. This definition can cause an isolated transaction involving real estate to be considered a business transaction. As a business, any gain or loss which arises therefrom is, by virtue of section 9, required to be included in computing income or loss, as the case may be. (l) evidence that the taxpayer and/or associates had dealt extensively in real estate. 4. None of the factors listed in 3 above is conclusive in itself for the purpose of determining that a gain arising on the sale of real estate constitutes income or a capital gain. The relevance of any factor to such a determination will vary with the facts of each case. 5. A taxpayer’s intention at the time of purchase of real estate is relevant in determining whether a gain on its sale will be treated as business income or as a capital gain. It is possible for a taxpayer to have an alternate or secondary intention, at the time of acquiring real estate, of reselling it at a profit if the main or primary intention is thwarted. If this secondary intention is carried out any gain realized on the sale usually will be taxed as business income. 6. The more closely a taxpayer’s business or occupation (e.g. a builder, a real estate agent) is related to real estate transactions, the more likely it is that any gain realized by the taxpayer from such a transaction will be considered to be business income rather than a capital gain (see 3(f) and (j) above). 7. The objects as stated in the charter of a corporation often offer little assistance in determining the intention of the corporation when real estate is acquired and later sold. Consequently, in any case where a corporation claims a capital gain in respect of real estate the corporate intention relative to the acquisition and sale thereof will be examined and determined by reference to factors such as those described in 3 above. In some cases (e.g., closely-held corporations) the corporate intention may be indistinguishable from that of its officers, directors and/or shareholders and in such cases their intentions, as based on their past and present conduct with respect to real estate, will accordingly be attributed to the corporation. 8. Passive members of a partnership or syndicate will be in no different position with regard to the taxability of real estate profits than that of the active members. The actions and intentions of the active members will be imputed to the passive members. 9. When the sale of shares in a corporation by a taxpayer is merely an alternative method of realizing profits from the sale of real estate, the profits from the sale of those shares will be taxed as if the real estate itself had been sold. (b) for real estate that is used for the purpose of gaining or producing income from a business or property, its conversion to inventory will not constitute a change in use (see also 11 below) and the proceeds from its ultimate sale will be treated in accordance with 15 below. 11. In accordance with the rules in subsections 13(7) and 45(1) property is deemed to have been disposed of for proceeds equal to its fair market value at the time when it undergoes a change in use and to have been reacquired immediately after that time for an amount equal to those same proceeds. The Department considers that the changes in use as described by subsections 13(7) and 45(1) do not include a transfer of property from one income-earning function to another such function of the same taxpayer. Accordingly, it is the Department’s position that subsections 13(7) and 45(1) do not apply where real estate that is used by its owner for the purpose of gaining or producing income from a business or property (e.g., an office building or rental property) is converted by its owner to inventory. The use (by sale) of inventory is still an income-earning function. The same rationale will apply when inventory is converted to capital property provided the property is, immediately after conversion, used by its owner for the purpose of gaining or producing income from a business or property. The comments in 12 to 19 below are predicated on the proposition that subsections 13(7) and 45(1) have no application for the reasons stated above. (b) the time of making application to the relevant authority for approval of a plan to subdivide the land into lots for sale, provided that the taxpayer proceeds with the development of the subdivision. See 23 and 24 below for comments concerning farmland and inherited land. 13. The units in a multi-unit residential apartment, or an office, warehouse storage building or any similar structure that is held as capital property by the owner will be considered to have been converted to inventory at the time when application is made to the relevant authority for approval to change the title to any such building to strata title, provided that the owner proceeds with the sale of the units. See also 18 below. 14. Where the relevant authority rejects an application referred to in 12 or 13 above, and the owner thereafter sells the property en bloc, the sale will ordinarily be treated as a sale of capital property if it would have been so treated had the property been sold before the application was made. 15. Where real estate that is used for the purpose of gaining or producing income from a business or property is converted from capital property to inventory, the action of conversion does not constitute a disposition within the meaning of paragraphs 13(21)(c) and 54(c). It is, however, recognized that the ultimate sale of real estate that was so converted may give rise to a gain or loss on capital account, a gain or loss on income account or a gain or loss that is partly capital and partly income. Accordingly, where such real estate has been converted to inventory, capital gains or losses, if any, will be calculated on the basis that a notional disposition of such property occurred on the date of conversion. The amount of such a notionally determined capital gain or loss in respect of the real estate will be the difference between its adjusted cost base, as defined in paragraph 54(a), (subject to the ITAR rules for property held on December 31, 1971) and its fair market value on the date of conversion. These notional capital gains or losses will be considered to give rise to taxable capital gains or allowable capital losses for the taxation year during which the actual sale of the real estate occurs and will be required to be so reported in that same year. The amount of any income gain or loss arising on actual sale of the converted real estate will be determined in accordance with generally accepted accounting principles on the basis that its initial inventory value is its fair market value on the date of conversion. See 16 to 19 below where the use of these procedures is illustrated by examples. 16. The following examples illustrate the use of the procedures set out in 15 above for non-depreciable capital property. 17. Where only part of a parcel of land is converted to inventory (e.g., one-half of the parcel is developed for sale as residential building lots), for the purpose of computing business income on the subsequent sale of the converted land the cost of the converted part is considered to be equal to its fair market value at the date of conversion. Similarly, where in a taxation year only part of the converted land is sold, the cost (for the purpose of computing income) of the part sold is the portion of the fair market value at the date of conversion of all the converted land as may reasonably be attributable to that part. The capital gain or loss, if any, on the sale of part or all of the converted land will be computed in accordance with 15 and 16 above. (b) the ultimate sale of the real estate may give rise to results similar to those described in 15 above. The classes of property described in Part XI and Schedule II of the Income Tax Regulations are, by virtue of paragraph 1102(1)(b) thereof, deemed not to include property that is described in a taxpayer’s inventory. Accordingly, where depreciable property (e.g., an apartment building) is converted to inventory it ceases to qualify for capital cost allowance for the taxation year during which the conversion occurs and subsequent years, but continues to have an undepreciated capital cost balance in the class of Schedule II of the Regulations to which it was assigned until its ultimate disposition, at which time the class will be credited with the lesser of the cost of the asset and its fair market value at the time of conversion to inventory. Note (2): Although not shown in this example, the land relative to the building will, except that it is non-depreciable, be subject to the same considerations with respect to the determination of a notional capital gain, income gain, and the reporting thereof in the year of sale. 20. Where a taxpayer acquires real estate and allocates its cost to inventory in the taxpayer’s accounting records, such accounting treatment will be considered to represent prima facie evidence that the real estate was initially acquired with the intention of reselling it at a profit at a propitious time (see 5 to 7 above). If such real estate is vacant land, it is the Department’s position that any gain on its sale, as such, will be business income rather than a capital gain. See however, 21 below which discusses the conversion of improved land from inventory to capital. (iii) the rental of part of the building on terms described in (i) and the occupation of the remainder thereof by the taxpayer for the purpose described in (ii). The same considerations will apply with respect to real estate, other than vacant land, that was purchased for the purpose of resale. 22. A taxpayer who constructs buildings for sale will not be considered to have converted inventory to capital property when part or all of any such building is temporarily rented for any reason. Rental revenues so received, net of expense, will be included in computing the taxpayer’s income, but since the building will, at all times, be considered to be held as inventory, it will not be eligible for capital cost allowance. (d) acquired the land referred to in (a) with the intention of reselling it for profit at a propitious time (see 5 above). 24. Parcels of farming or inherited land referred to in 23 above may be difficult to sell en bloc and the land may be sold by subdividing it and selling the lots individually. It is the Department’s view that the filing of a subdivision plan and selling lots thereunder does not in itself affect the status of the gain notwithstanding that such subdivision may enhance the value of such land. A gain on the sale of farming or inherited land will remain a capital gain if an examination of all other facts, both before and after subdivision, establishes this to be so. However, where the taxpayer goes beyond mere subdivision of the land into lots and installs improvements such as watermains, sewers or roads, or carries on an extensive advertising campaign to sell the lots, the taxpayer will be considered to have converted the land from a capital property into a trading property. Where such a conversion occurs see 15 above for treatment of gains or losses arising from the ultimate sale of the property. By some reports, including those by Statistics Canada and TD Canada Trust released this week, real estate speculators hoping to take advantage of a housing market crash may be waiting a long time. Housing sales activity weakened in the latter half of 2010, but home prices didn’t tank like some feared after the boom earlier in the year. Statistics Canada figures released show that indexed new housing prices across Canada rose for the third consecutive month in October, albeit modestly. Leading the way was Saskatoon, driven by lower unemployment and higher labour costs than in other Canadian cities. Calgary was among those markets that saw a dip in prices. 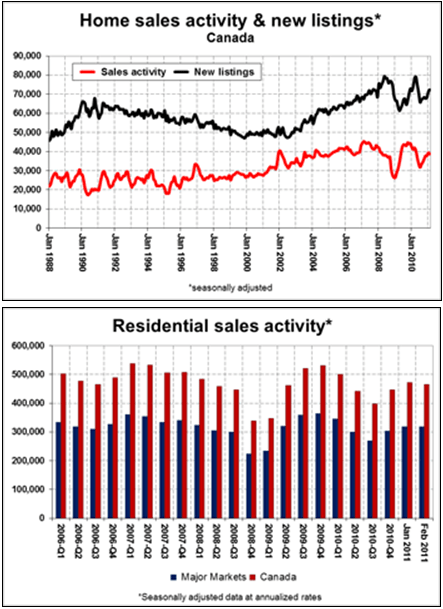 The TD report predicts housing sales activity to increase in the first half of 2011 and prices to soften slightly, and the bank has adjusted its earlier sales forecasts to more conservative numbers. Other financial organizations go as far as to predict strong sales activity and upward pressure on prices will continue in hot markets. A crash is unlikely by all accounts. Continued strife in U.S. and European markets has the Canadian economy in a holding pattern; until there are convincing signs of a recovery, home sales activity and prices here are unlikely to make momentous gains. This week, the Bank of Canada released its decision to hold the overnight lending rate at one percent. Major lending institutions think a rise in interest rates won’t happen until mid-2011, which will help to keep Canadian housing affordability and sales activity stable in the meantime. Check your potential payments at CENTUM negotiated interest rates using CENTUM Mortgage Calculators. Whether you are planning to buy-sell-lease-invest your first home or your investment, contact us today! 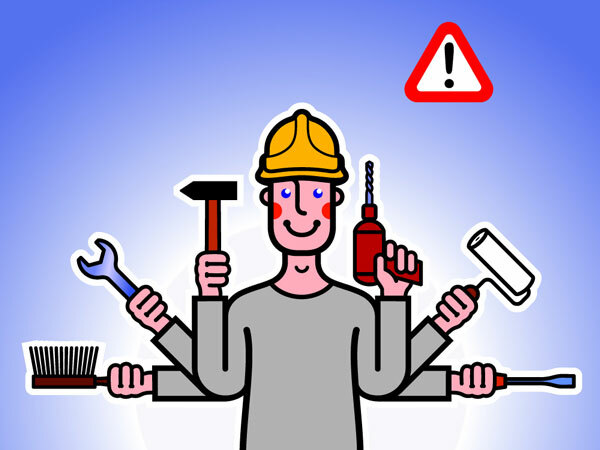 Renovation: Do it yourself or Expert’s Touch? Do it yourself or Expert’s Touch? Many homeowners these days are willing to get their hands dirty with home improvement projects in the hopes of saving money – especially with the fabulous free courses being run by many home improvement superstores on an ongoing basis. But although some projects can be tackled by homeowners, the do-it-yourself (DIY) route isn’t always the most economical – or safest, for that matter. It’s often difficult to determine if a project entails more than you can realistically handle. Most people tend to gauge the complexity of a project by doing research online, as some DIY websites grade a project’s difficulty. But you should also look at the tools that are required for the job. If you come across complex tools you know little about, it may be best to call in an expert. If you’re unsure about your ability to correctly finish a project, get an expert opinion before proceeding. Sometimes, you may end up spending more money to repair a bungled DIY job than if you had hired someone to do it right from the onset of the project. When safety is an issue. Getting involved with your home’s electrical system can be risky. Not only could you be electrocuted, but doing a job incorrectly could also create a safety hazard within your home’s structure. In Ontario its against the code, as per law you must hire licensed person. Another often unsafe DIY project includes extending a gas line. If you don’t know how to check for gas leaks, for instance, this DIY project could lead to an explosion or carbon monoxide poisoning. As well, if you’re considering tackling a project that involves heights, make sure you have the know-how to safely complete the job or call in an expert. Even some power tools can be beyond your capabilities and result in serious injury or death. It’s always important to remember that potential money savings are not worth risking safety. When water is involved. Leaks and water damage can lead to more costly and complicated repairs. If left unfixed, they can lead to mould, which affects air quality and, if found during an inspection, can be a deal breaker on a home sale. Water-related projects don’t have to strictly involve your home’s pipes. Putting in a skylight may seem like a DIY job you can handle. Do it incorrectly, however, and you could end up with a leaky roof, water damage and mould. If the costs of materials or tools are too high. Sometimes the costs of materials and the expense associated with making a mistake are enough to make hiring an expert a no-brainer. For something like crown moulding, for instance, you need an expensive tool and the material itself is expensive. A kitchen cabinet can cost a couple hundred dollars and, if you order incorrectly, there may be a restocking fee and special orders may be non-returnable. Being off on measurements for granite countertops can also prove to be a costly error. If the project is too big. If you’re planning on replacing all the windows in your home or remodelling your kitchen, think twice about how much of the project you want to take on yourself. Often, you can leave the heavy lifting to the experts, and work on the finishing touches, such as painting or tiling backsplashes. But, while installing hardwood or laminate flooring can be a good DIY project, its complexity will largely be determined by its scale. For instance, installing laminate flooring in a small, square bedroom is often manageable for homeowners to do on their own. But doing a larger-scale flooring project – involving a transition between rooms or perhaps around a kitchen island – is where people often get tripped up. If you decide to call in an expert, make sure you do your research, get multiple quotes, ask friends and family for referrals and check references. Unfortunately, there are many contractors who claim to know what they’re doing and then get in over their heads, which could end up costing you in the end as well. Share your comments on our Facebook page. Online mortgage calculators are helpful in planning for a home purchase. For more information on CENTUM broker negotiated rates, visit Centum.ca for a referral to your nearest broker.